What with the Fourth of July just around the corner, and Bastille Day soon after, I was inspired to come up with a red, white, and blue sweet treat that takes advantage of summer’s bounty, is finger-food friendly and perfect for sharing with friends in a picnic or casual party setting. I hunted through my massive collection of cookbooks and was inspired by a bar recipe from Karen Boyce’s Good to the Grain for it uses rye flour and rolled oats (and I’m a big fan of experimenting with different flours and grains). Her recipe also uses jam, but I decided to freshen it up by using fresh fruit instead. Additional tweaks include using light brown sugar vs. dark which I think go better with the summer fruits, reducing the sugar by eliminating the white sugar entirely as well as using fresh fruit vs jam, and reducing the salt. Preheat oven to 325°F (162°C, Gas Mark 3) and prepare a baking pan by rubbing the bottom and sides with butter. I used a 9″x11″ (23 cm x 28 cm) ceramic dish, but a 9″x9″ (23 cm x 23 cm) ceramic or metal pan would be fine; 9″x13″ (23 cm x 32.5 cm) would be too large. In a small saucepan, melt the butter over low-medium heat and let it cool. 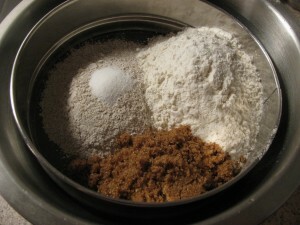 In a large bowl, add the AP flour, rye flour, light brown sugar, and blend together well with a whisk or fork. If you prefer, you can sift all the ingredients together into the bowl. 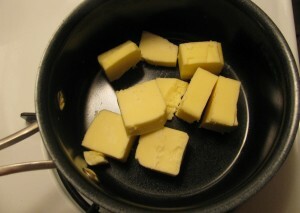 Add the cooled, melted butter and vanilla and stir with a rubber or silicone spatula, or wooden spoon, until combined. Using your hands, press the dough into the bottom of the prepared pan. No need to worry about the sides. 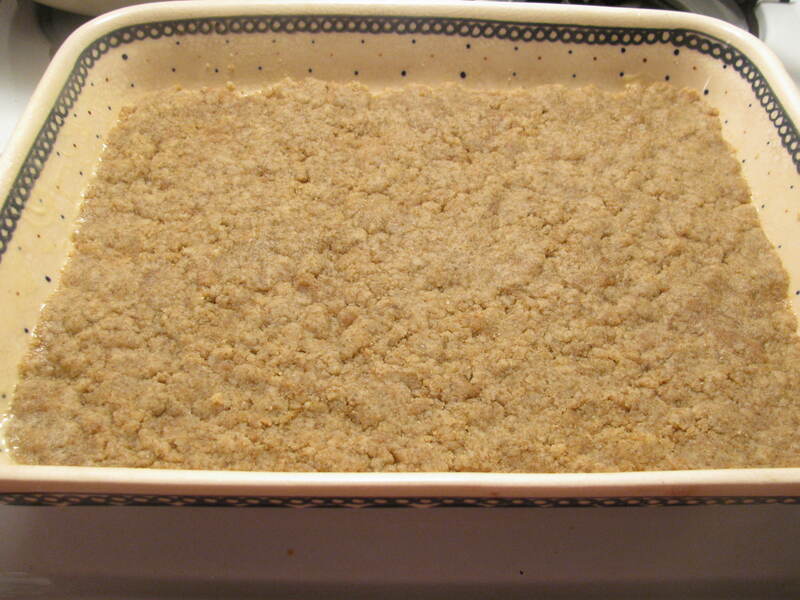 Place in the freezer for 30 minutes (you’ll be making the crumble topping during this time). 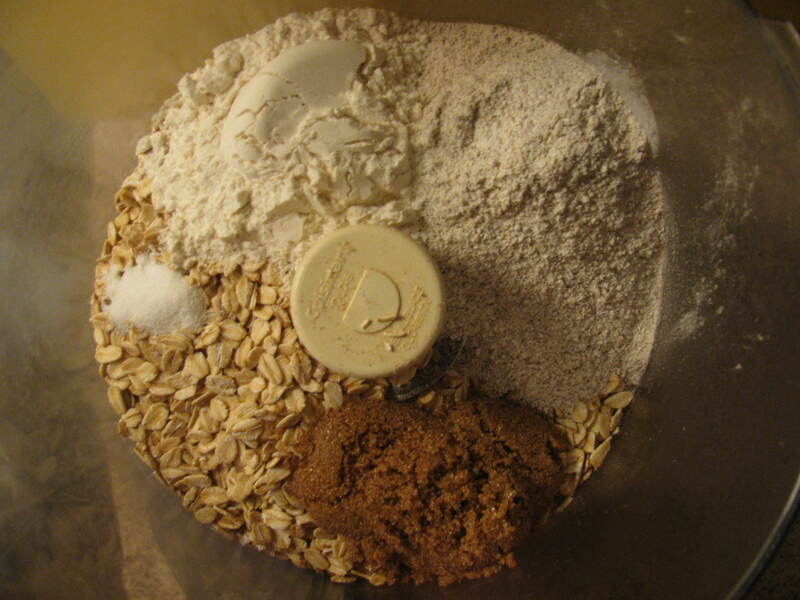 In the bowl of a food processor, add the rolled oats, light brown sugar, rye flour, AP flour, and salt. Pulse until the oats are partially ground (no more than 5 seconds). Put the ground, dry ingredients into a large bowl and add the melted butter. Blend with your hands and squeeze the topping so that small crumbles are created. Refrigerate while you prepare the fruit and bake the crust. Remove the pan from the freezer and place in the preheated oven. Bake for 30-35 minutes, or until golden brown and firm to the touch. Remove from the oven and let cool on a wire rack. Increase oven temperature to 350°F (180°C, Gas Mark 4). Wash the blueberries and strain to dry and set aside in a bowl. Wash the raspberries and and strain to dry and set aside in a separate bowl. 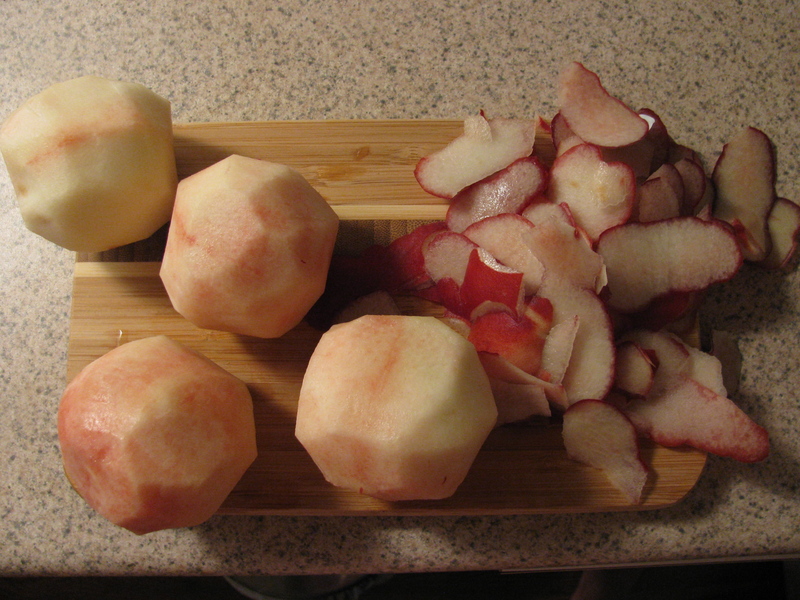 Remove the peach skin and halve each peach. Remove the pits. Dice into small pieces, 1/3′ – 1/2″, approximately the size of a blueberry or raspberry and set aside in a separate bowl. About 5-10 minutes before you are ready to bake the bars, with a pastry brush, brush the crust with a thin layer of egg wash (egg whites only or beaten whole egg). Also, remove the bowl with the topping from the refrigerator at this time. Place pan with egg-washed crust in the oven and bake for 5-10 minutes…just enough for the egg wash to dry out a little. This will help create a barrier between the juices of the fruit and the crust…no one wants soggy crust. Remove pan from oven and cover crust with fruit. Select one of the three fruits and scatter evenly over the crust, repeat with the second fruit, and repeat again with the third fruit. 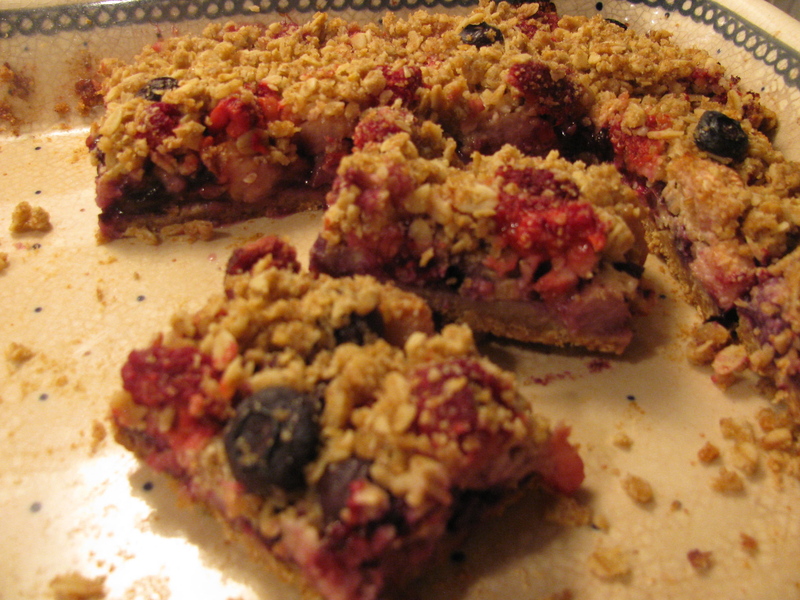 Using your fingers, scatter the crumble topping evenly over the fruit, leaving bits of fruit visible. We want to make sure we see the red, white, and blue fruits. Bake the bars for 50-60 minutes or until the crumble topping is golden and the fruits are soft and slightly bubbling. I suggest you remove the pan after 50 minutes and test the softness of the fruit with a cake tester or fork as the darkness of the rye in the topping may make it a little difficult to tell whether the topping is golden from baking or naturally so. Remove from oven and let cool completely. Cut into 16 bars if using a 9″ x 9″ pan or 18 if using a pan similar to the size I used (9″ x 11″). May be refrigerated or left at room temperature. If you are going to keep them for several days, I recommend refrigeration, but serve at room temperature. 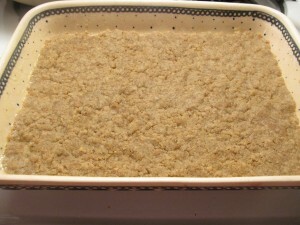 Note: they are best served same day for that is when the crumble topping has the best texture. 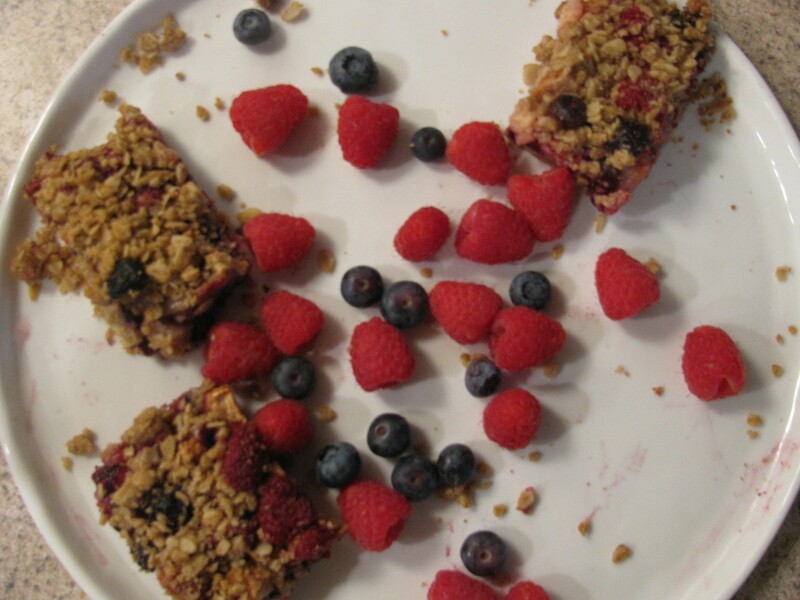 This entry was posted in Bar cookies and tagged Bastille Day desserts, Blueberry Crumb Bar, Fruit Crumble Bar, Good to the Grain, Good to the Grain Crumble Bar, July 4th desserts, Raspberry Crumb Bar, Red White and Blue Fruit Bar, rye flour desserts, White Peach Crumb Bar by hboltson. Bookmark the permalink. Brilliant! And delicious. Thanks Helen! Can’t wait to share this one with my daughter! your post is interesting and useful. Delicious. Thank you Helen, I love your website. Do you have any toffee recipes to share?